If you’re like me you buy products for your kitchen and the more things they can do the better. So I have an electric pressure cooker, a Tower T16005 which I’ve had for a couple of years. I’ve used it to do stews, cook veg but I’ve never really checked out some of the options that you can use on it like the yoghurt setting. Now I eat quite a bit of plain yoghurt but I hadn’t really thought about making my own until I bought an ice cream and yoghurt maker and decided to test out the yoghurt maker part. It worked great but I could only really make 1 litre or at the most 1.5 litres at a time and I wanted to make more and then I remembered that my Tower pressure cooker had a yoghurt function so it was worth a try. Why not check out the Tower T16005 electric pressure cooker if you want to make overnight yoghurt whenever you want it. 1.4 Step 4 – Set the timer and start. 1.6 Step 6 – Decant into pots and refrigerate. I made a little video showing you some pictures or the steps I took but it was very easy and I’ll go through it for you here in case you don’t like watching videos. 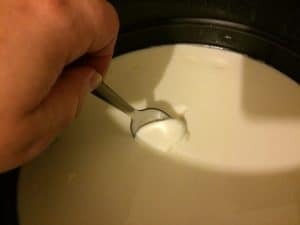 You need a yoghurt starter to change your milk to yoghurt, when I made my first one I used a small pot of plain bio yoghurt which I bought from the supermarket. It has to be bio so you get the right reaction. After that I bought a yoghurt starter from Amazon.co.uk which you add to a litre of milk and run through the yoghurt making process. 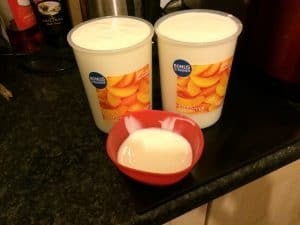 You put it in a jar and use it to start your yoghurt, 3 tbsp for each litre of milk. 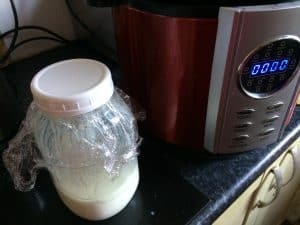 When I used all of that up I bought some other dried yoghurt starter that you use to make yoghurt then you keep out 3 tbsp for each litre you want to make in the future, I always make 2 litres so I keep out 6 tbsp of yoghurt and put it in a container in the fridge until I’m ready for it. Although you can use skimmed or semi-skimmed milk, when you make home made yoghurt high fat normal milk is better to get a thicker yoghurt. If you want to use normal bottled milk you will need to boil it but you can use long life which is already sterilised and much quicker and easier to use. As you can tell I like quick and easy. Whether you make 1 litres or 2 litres of yoghurt, pour the milk into the inner pot and stir in 3-6 tbsp of starter (3tbsp per litre). You just need to stir it through, nothing fancy. Step 4 – Set the timer and start. Place the lid on your pressure cooker and make sure that the pressure valve is open as you don’t need any pressure to make yoghurt. Select the yoghurt function using the menu button, on the Tower T16005 it has a preset of 5 hours and I like to run it for 12 hours so I adjust it using the hours button which will add 1 hour at at time. If you run it for 12 hours you can run it overnight and it’s ready in the morning. Press start and that’s it. If you run it through the day and want to check the yoghurt’s progress you can just remove the lid and test how thick it is. If you run it overnight when you check it in the morning you should have some thick yoghurt. You might find it’s not as thick lower down but when it all mixes together in the pot I find it’s thick enough for me. Some people like to strain their yoghurt and get really thick, which i’ve tried. I just found it too much hassle and I only got 1 litre of yoghurt out of 2 litres of milk but the choice of course is yours. Step 6 – Decant into pots and refrigerate. 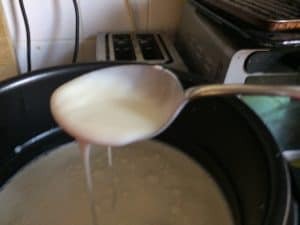 When I first made my yoghurt I just washed out a couple of 500 ml size pots that I had from bought yoghurt and used them. After I’d made a few batches I bought some Sistema KLIP IT containers which hold one litre each. I just spoon it out into the containers although I’m thinking of getting a jam funnel as I think that might make it easier. Don’t forget to take out some spoonfuls to start your next yoghurt. You can make stewed fruit and add that to flavour your yoghurt, or just fresh fruit. If you don’t want to add sugar but like it sweetened you can use sweetener or honey. Yoghurt is great for breakfast, you can add oats or granola which is great for getting your protein in. I like to add protein powder and fresh fruit to mine. If you have an electric pressure cooker why not see if you have a yoghurt option included. The Tower T16005 is reasonably priced if you haven’t got one and are looking to buy an electric pressure cooker or if you’ve been thinking about buying the Instant Pot Duo you can make your yoghurt in there too.